It seems to me that I'm attracted more and more to black and white interiors. So naturally I had to make a new board on Pinterest! Here's some of my favorites! 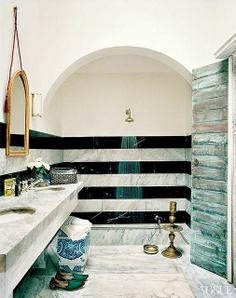 I love the vertical stripes of marble on the wall. Not to mention the blue and white garden stool. One of my favorite color combos is navy with black and white. I'm also a big fan of gold mirrors with black and white. 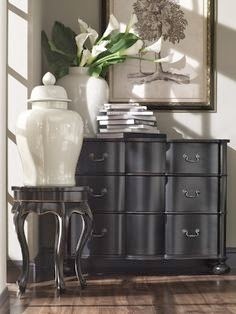 I like the clean simple look of the black chest with two white ginger jars. The green color introduced with the flowers is just the perfect amount of color. As I'm in the process of making a few changes around the home, Pinterest has been a huge visual help. Big love here, those are so sharp!! I love the black and white too and add a gold mirror... very rich! I'm loving black and white right now with touches of gold/brass too. Love! 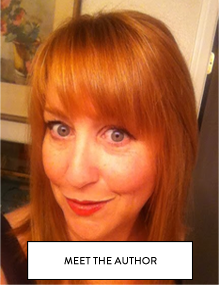 Thanks for stopping in and leaving a comment! 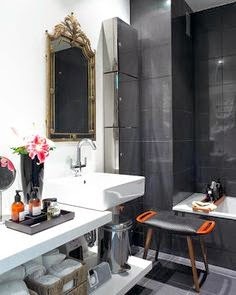 Sharon I love both of the baths you pictured; the addition of green to the Black and white is so striking!! I too created a black and white board on Pinterest. Love the images you shared! WOW what a FAB and classy post :) I hope you had a great week so far.